As part of preventive maintenance we decided to change the belt on my TravelScoot. Melissa came so she could help and learn more about how to perform maintenance on her own scoot. In this picture Alan is reading the belt change instructions. This is the hex tool that came with the scoot. Alan and Melissa decided the wheel needed to be propped up, so they turned the seat upside down and propped it on the u-bar part of the yoke. Melissa is rolling the old belt off. Now they're working together (each with a hex tool) to get the wheel off. There was some cursing involved because they were having a hard time getting the wheel loose. Alan went and got the big guns -- his ratchet set. Now Melissa is rolling the new belt on. Alan is putting the pin back that holds the wheel on. My TravelScoot fits in a Tokyo taxi. Yesterday it experienced an earthquake and no damage. On to Hong Kong. I have learned a few things about TravelScoots having taken mine around the world numerous times this year and one of them is watch the inclines you try and take them up. In front of the Intercontinental Hotel in Hong Kong, the hill is a killer. Today I was at a store at Harbor Centre and I noticed the 'click' which signals your belt is slipping. That is the kiss of death for the TravelScoot because it means you are about to lose your belt. When I changed hotels to the other Intercontinental, the belt stretched and it was over. Luckily I had one more belt (2nd one I've changed in 7 days) but I was now without any backup belts. I went to http://www.travelscoot.com/ and learned that they have an agent in Singapore so emailed Nat at http://theruggedtree.com/ and told him of my plight. He doesn't take credit cards but we figured out we can do it via paypal (http://www.paypal.com/) so he went to the postoffice and express mailed it to me. For those of us who depend on their TravelScoots being without it would be a disaster. It should arrive in 2 days and I'll feel relieved. Anyway, I would like to recommend Nat as a good person to know if you travel in Asia and especially Singapore. He is my 'angel' this week. I will continue running around Hong Kong secure in the knowledge that I have another belt if this one breaks. 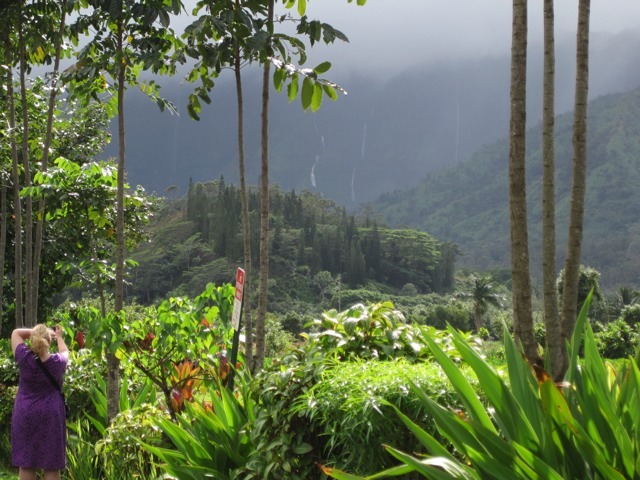 Everywhere we went in Kauai there was another beautiful view. Some are natural beauty and others are manicured into perfection. In the last picture I couldn't resist capturing Melissa and Greg sharing a moment while we waiting for it to stop raining. The lobby at the Kauai Beach Resort. It was breezy, cool, and tropical. We rented a Chrysler Town and Country. 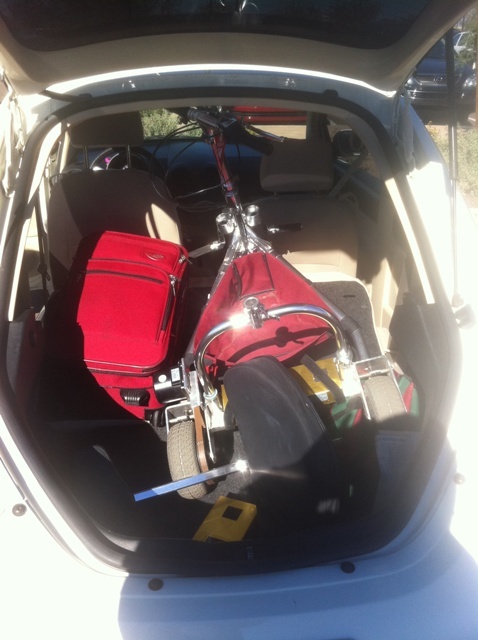 All our luggage and two fully assembled TravelScoots fit in the back. 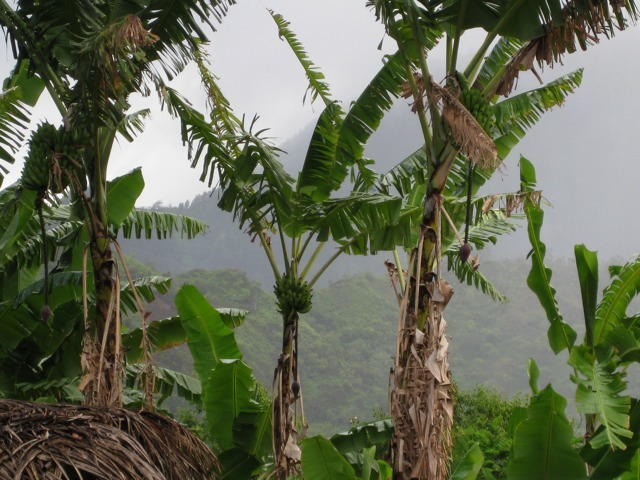 It was about 25 miles from the Kauai Beach Resort to the Princeville Westin. This was one of the random pictures I took through the van window on the trip. We're home! (For a week at least.) This is the main building for the Princeville Westin. This picture was taken from the TravelScoot vantage point. Sunrise at the Kauai Beach Resort. I call this one 'Breakfast with Birds'. If you look closely you'll see three birds in the picture. This was taken in the resort restaurant, which is also open to the outside, and visits from birds! I felt like a kid riding my scoot under this! 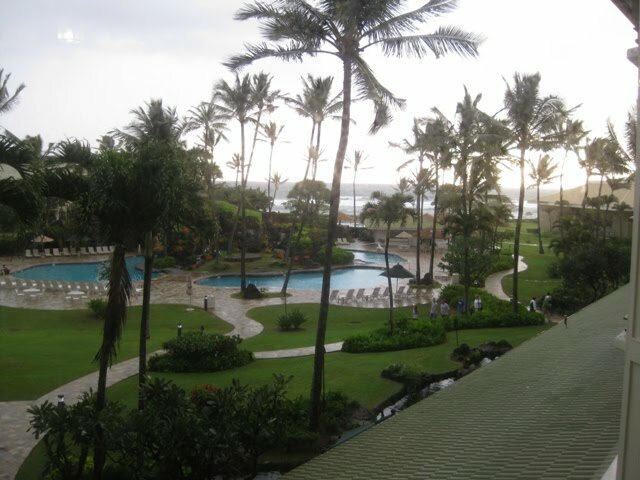 This is the Kauai Beach Resort where we stayed the first night. It was very close to the airport and since we got in so late and had traveled for so long, we really just wanted to get settled in for the night. 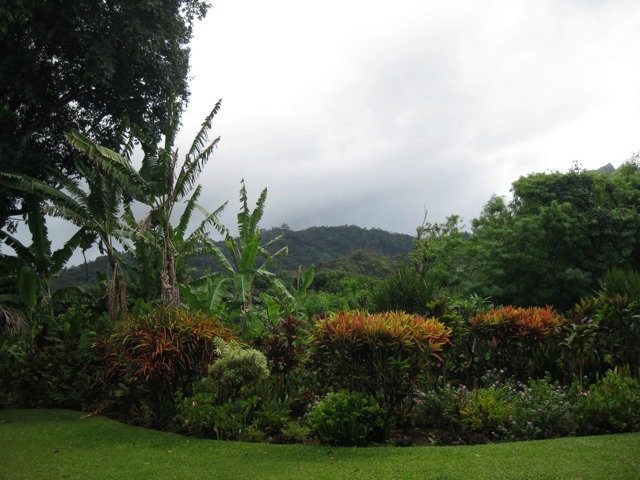 The next morning, while Melissa and Alan went to get our rental car, I explored all the paths around the resort. I was also able to go out pretty close to the water. I just love hearing the sound of waves crashing to shore. I wish I could have frozen that moment in time -- it was bliss. 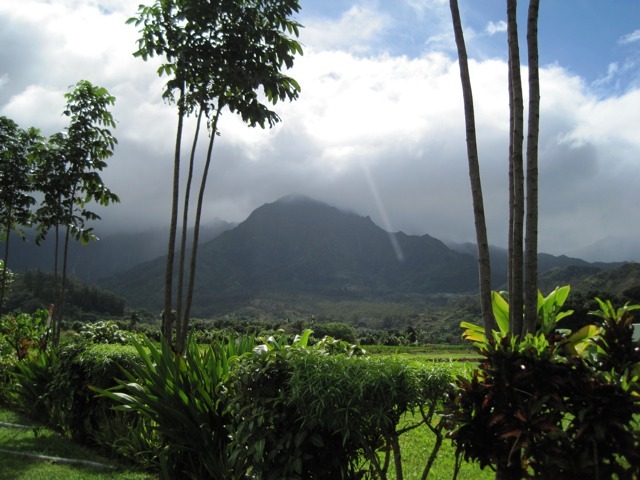 This was taken shortly after we landed at the Lihue airport in Kauai, Hawaii. From left to right it's me, Alan, Melissa, and Greg. Our TravelScoots came through the trip just fine. That pink and white bag on the front of mine has my new iPad in it. I'm very pleased with how useful it was on the trip. We were all able to check our email and research things to do on the island. It rained frequently and usually without warning while we were in Hawaii, so when I'd get in the pool I'd put this ziplock bag over the throttle and other electronic parts of my scoot. I zipped it closed as much as I could and it worked really well. These were usually very light rains that lasted for a minute or two. Anything more and me and my scoot would have been headed for cover. My Uncle Ken and my brother-in-law Jimmy, trying out the TravelScoots at the Audubon Zoo in New Orleans. We were there for the Tulane Transplant Picnic, a celebration for organ donors and recipients. 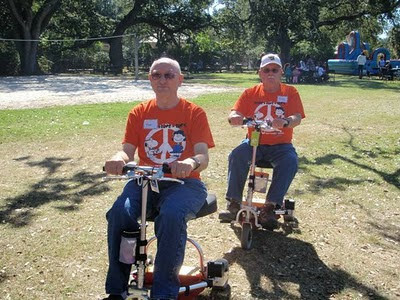 They said they had a blast riding through the zoo and that people were asking them where they got their scoots! This is my TravelScoot in a 2004 VW Beetle. I am flying back to Phoenix and will be gathering with my wife and children and sole grandchild, 14 month old Raya. To make it easier for my kids, who are staying at my ex-wife's house, I have taken a suite at a nice resort in Scottsdale and will be using my TravelScoot to run around the resort and go to the feast that the hotel puts on. I leave then on Saturday to fly to Japan and China again (5th time I think this year). I hope everyone haves a great Thanksgiving and remembers all we have to be thankful for, including the TravelScoots that free us. Hi everyone! I haven't been posting because I've been in Hawaii celebrating my 50th birthday. This photo of me and Alan was taken on the island of Kauai. The views there were just incredible. We flew American Airlines from Baton Rouge to Dallas, then to Los Angeles, and from there to Lihue. Our friends Melissa and Greg were with us. 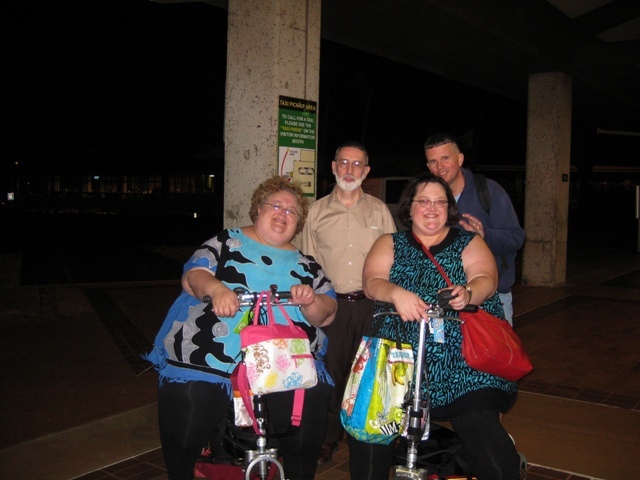 Melissa is a new TravelScoot owner but has borrowed one for previous trips. We quickly established a routine for the flights. Going through security in Baton Rouge and then in Lihue for the return trip were almost identical experiences. We rode our scoots through the security line then got off to walk through the scanner. They pulled the scoots through an adjacent gate, swabbed them and gave them back to us. Melissa had one regular lithium ion battery and I had two. If you are asked what kind of battery it is, my experience has been that what they want to know is that it's non-spillable. At the gate we went to the agent to get gate check tags for our TravelScoots. These tags seem to be a little different at each airport. Sometimes we get a receipt and sometimes we don't. We were able to preboard on each flight. We rode our scoots to the door of the plane. As soon as I stopped Alan took off the lithium ion batteries and put them in his carry on to take on the plane. 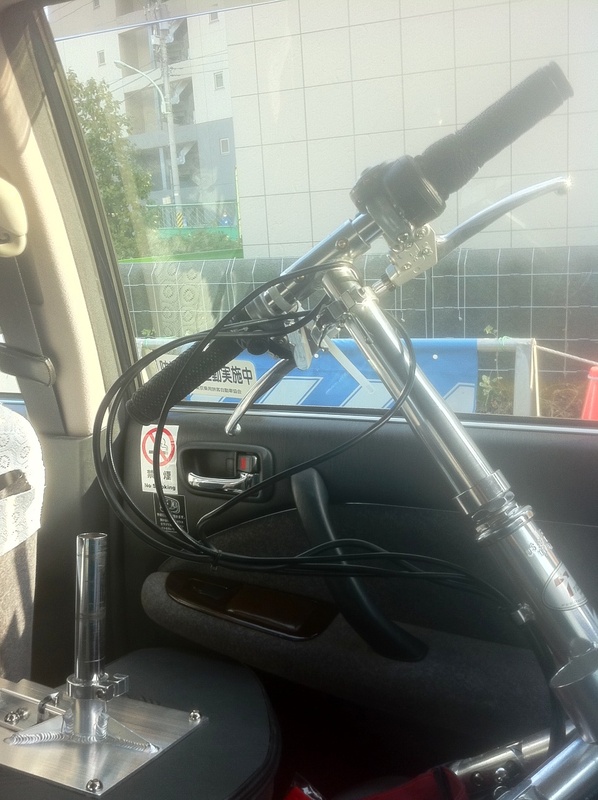 I took care of lowering the handlebars all the way down, then detaching the handles and covering them with the protective cover. To see what the protective cover looks like in use and to read Hardy Huber's travel instructions, go to http://mytravelscoot.blogspot.com/2009/05/new-and-easier-way-of-airline-travel.html. When we landed at the next airport we waited until last to get off the plane. This gives the crew a chance to bring our TravelScoots to the plane door. Alan and I were amazed to look out the plane window on one flight and see a man carrying BOTH TravelScoots like they were barbells while he climbed the stairs to bring them to the plane. That was an incredible missed photo opportunity. Once we were off the plane we reversed the procedure we used getting on the plane. Alan reattached the batteries and I set up the handlebars. Melissa was able to ride her scoot on each jetway (the hallway between the airport and the airplane) without much trouble. In two of the airports Greg got behind me and put his hand in the center of my back and pushed to help me get up the inclines. I really needed the extra assistance I got from Alan and Greg so I wouldn't want to have to travel alone with my scoot, but I know others do it all the time. Melissa did just fine with one battery for the three airports. I used all of one battery and part of a second, but still had charge left over to tour the resort the first night. Alan brought both my chargers and made sure both batteries were fully charged each night. In future posts I'll tell you more about the fun we had with our scoots, but first I wanted to go over the travel details. If you've never flown with your scoot my recommendation is to be sure you have plenty of time on any layovers to give them time to get your scoot, and for you to get it reassembled and rolling again. We've found that lowering the handlebars, detaching them, and covering them is the best way to keep the scoot from being damaged. Removing the batteries and taking them in our carry on ensures that no one takes the scoot joyriding and it also keeps the batteries from getting damaged. One one previous trip a battery that was left attached was returned to us dragging the ground. If you don't want to put the battery (or batteries) in your carry on, your other option is to follow Hardy Huber's travel instructions, at http://mytravelscoot.blogspot.com/2009/05/new-and-easier-way-of-airline-travel.html.